One of our good friends, Cam (whom you will hear from more as I start posting the TSW LP videos), was coerced convinced … finally decided (yes, decided) to try out Final Fantasy so that he could play with Sylver, Chaide, and me. Why is she always so stoic when everyone else is cheering? So he picked up the trial this weekend, and ended up subbing sometime yesterday so he could (1) roll and alt and (2) get above level 20. He’s stuck on the storyline at the moment, though, so we ran a quick Sastasha to help get him to the next dungeon. I’m hoping maybe this weekend we could get him caught up on the next one. Maybe even Thursday! Sylver is currently on the main story part where she needs the 8-man Trials, so I told her to poke the FC when she gets back from a convention this weekend (she leaves tomorrow, of course, when they’re going to run some stuff to help folks out) because they’d be more than willing to help her get through the story requirements, and into Heavensward! I wish Chaide and I could help her, but one can only do so much when you’re not max level, haha. Besides the fact that I’ve been doing some serious guild-mastering over in WildStar, which cuts into FFXIV time. Lots to do to prep for F2P in 6 days! 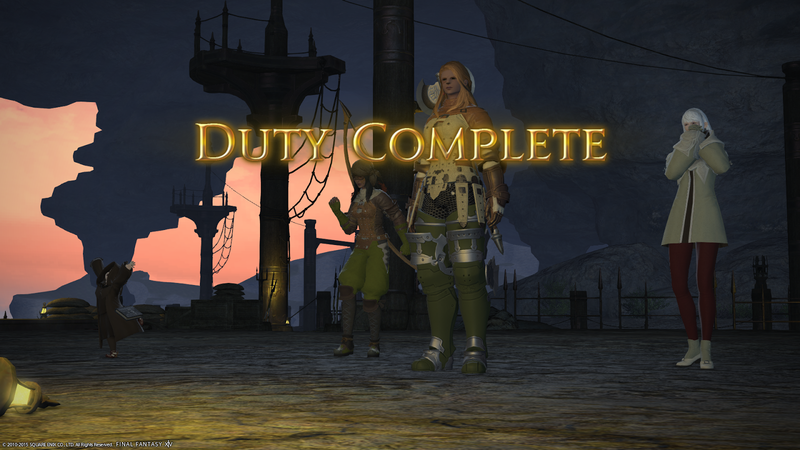 We also did a few quests in Gridania to try to level our second classes, but we didn’t get very far. I’m hoping we can get into game on Thursday a bit, too, to try to level our second classes up. I’d very much like to continue to storyline soon!